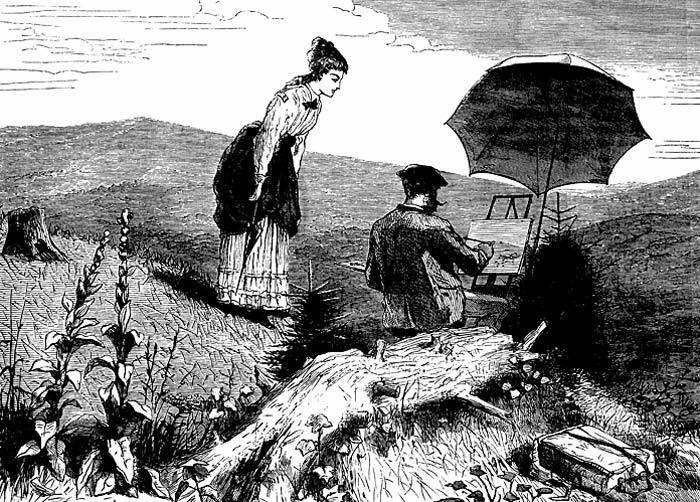 The Artist in the Country (detail), wood engraving by John Karst after Winslow Homer; published in Appleton’s Journal of Literature, Science, and Art, June 19, 1869. New Hampshire Historical Society, bequest of Catherine H. Campbell. The White Mountains, solid and ageless peaks of granite, rise up across the landscape of northern New Hampshire. Their scenic beauty has intrigued visitors for two centuries. Inspired in part by the new nation’s search for a cultural identity, the natural wonders of the American landscape began to attract artists, writers, tourists, and entrepreneurs in the second quarter of the nineteenth century. By the 1850s, growing numbers of American and European artists toured and sketched in the mountains each summer. Over the next fifty years, artists who visited New Hampshire often interpreted the White Mountains in ways designed to appeal to and attract tourists and to serve as souvenirs of their mountain visits. Hotel proprietors encouraged artists to work at their White Mountain establishments. Both were, in a sense, pursuing the same ends, selling the landscape to consumers of mountain scenery. Authors of guidebooks also promoted the area and, like the artists, taught visitors how to see and interpret the landscape. The most influential and introspective of the guidebooks, Thomas Starr King’s The White Hills: Their Legends, Landscapes, and Poetry, first published in 1859, introduced travelers “to the noble landscapes that lie along the routes by which the White Mountains are now approached by tourists.” The author’s transcendental views long affected the way people looked at and painted nature. The works exhibited here are arranged geographically, following routes that guidebooks show nineteenth-century travelers took while touring the White Mountains. The journey begins as a tourist might have approached the mountains (across Sebago Lake by steamer and toward Mount Chocorua by stagecoach), continuing to North Conway and up the Saco River valley, exploring the splendors of the area's most notable passes and mountains (Crawford and Franconia Notches and the Presidential Range, before returning again to the idyllic town of North Conway. The paintings help reveal the significance of White Mountain scenery, of the nineteenth-century artists who depicted it, of the authors and hotel proprietors who promoted it, and of the consumers who acquired, owned, and cherished White Mountain art. Through these paintings, take a scenic tour of the region that has lured visitors and inspired artists for almost two hundred years.